Thailand islands Koh Kred. 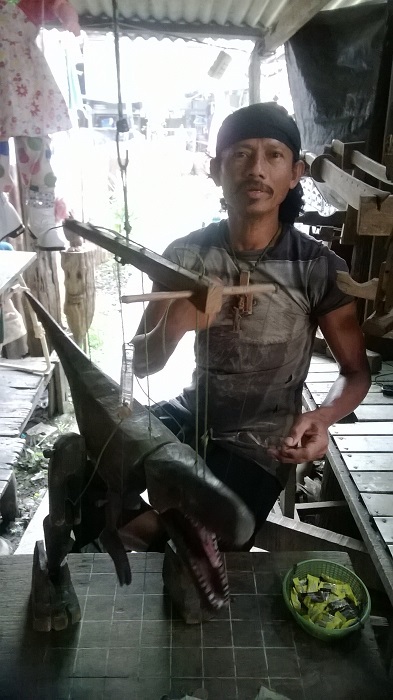 Talent is bountiful in Amazing Thailand and no less fascinating on the man-made island of Koh Kred. 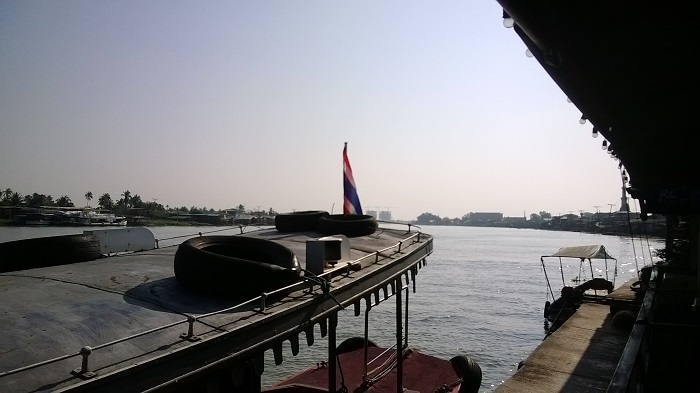 Taking a boat ride on the Chao Phraya River is one of the most scenic tours you can do in this great city. The serene waters of the river, interspersed with the occasional long-tail boat or cargo ships chugging along gives a picturesque view from the river of this great city skyline. Not only is it a peaceful ride but also a nostalgic one as you get a different view of life by this ancient river from the modern homes and hotels that line the shores to the old river folk homes, seldom seen from land that still enjoy the old ways of life in this fast paced city. 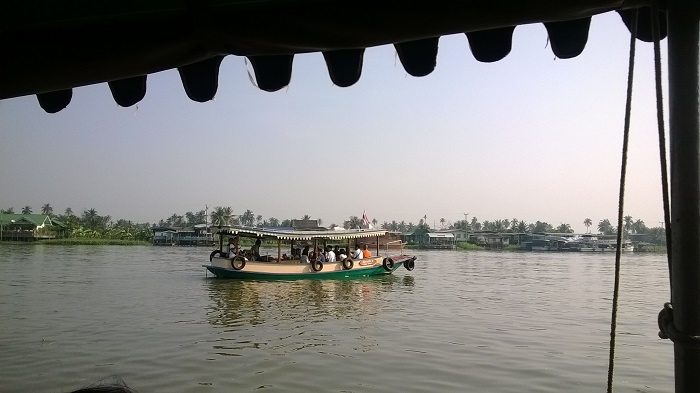 Boarding any of the boat services from jetties and piers along the river will get you to Koh Kred Island, which is actually a constructed island from a mud bund as old as Bangkok City itself. Built up over time it has grown to be a bustling little island on weekends as the rest of the week is rather quiet and not many visitors come to this place. About an hour boat ride from the jetty and at the mouth of the river that actually is a diversion for two sources in the river, Koh Kred Island is noted for its mostly Burmese migrants that have settled for generations here. Koh Kred Island is one of the many gems hidden in the city of Bangkok and few foreign tourists actually come here except for those who know about the island. On a weekend it is frequented by the locals who visit this island mostly for their famous snack or “khanom” production as well as their unique and signature terracotta potteryworks. Located within the OTOP (Local Produce) market is a very unassuming gentleman by the name of Khun Bird. At first glance, his hippy like appearance and fairly dark little cubicle may be easily by passed as you wander among the many stalls and vendors selling knick knacks and pottery products. Nestled in a little alcove is his work station and little stall. As the entire OTOP market place is constructed of wood and has not been really up kept over the years, lighting on the inside is poor and the dark colour of the wooden structure does not really help. However, what catches your eyes are the few handmade wooden puppets he has hanging on the wall and on his little work table. 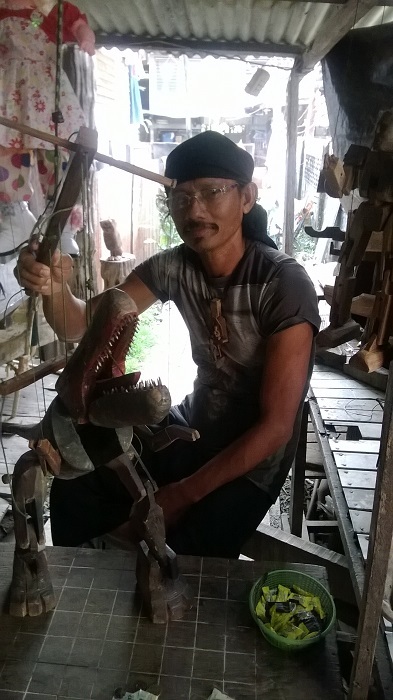 Khun Bird is a self-taught puppet maker, having loved puppetry since a young age. 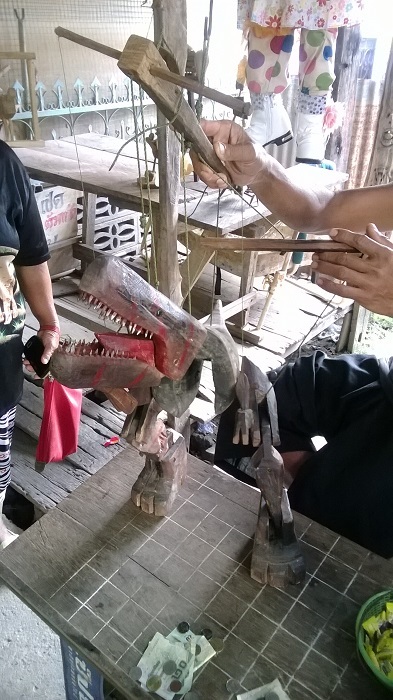 He is not into the traditional and classical puppetsoften found in Thailand but rather indulges in fun and whimsical puppets that would bring a smile to any child or even an adult. He prefers to work with a wood medium, painstakingly crafting and sculpting his wooden puppets from pieces of wood often salvaged from wooden crates or construction sites or old buildings. Here is one unique way to recycle items in a fun way and yet make a living! He constructs string puppets but of a higher quality and therefore allowing the puppets to be more flexible and easier to manipulate with more articulating points. 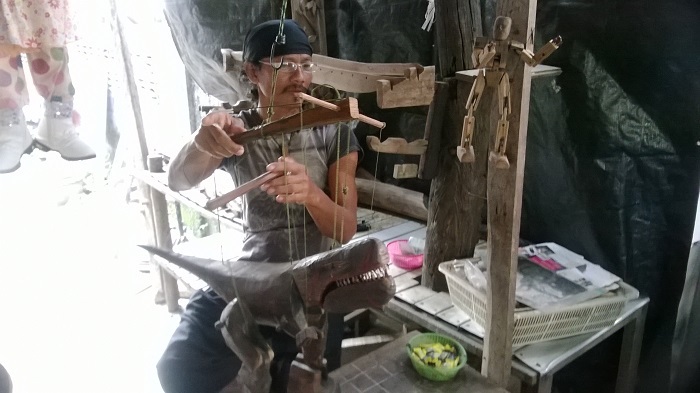 He can make commissioned pieces or even if you would like to place an order for his puppets but it will take some time as each puppet is individually handcrafted. His latest invention at this time was a wonderful lifelike dinosaur puppet complete with stomping legs and snapping jaws! The marvellous looking T-Rex dinosaur would have made a nice collection for any puppet collector. He also makes clowns and robots for collectors who are interested in these sorts of puppets. So if you have the time over a weekend, do pay a visit to this fascinating little island in the middle of the Chao Phraya River. Take a walk around the historical museum and temple on the island, enjoy the many snacks freshly made by the vendors while you mooch among the potters and clay throwers and at the same time, look for Khun Bird in the OTOP market at his little stall. He would be most pleased to chat with you and be entertained by his skillful puppet mastery!